The month of December begins the hibernation season in my home. While everyone around us is celebrating and having parties, we are finally enjoying some quiet time and moments of reflection. This year, I am especially grateful as it will be the first time in many years that this month has not been stressful. Actually, this whole year has not been stressful. What a novel concept! While others are celebrating kith and kin, I am celebrating the return of my life and embarking on a new venture. My husband is celebrating the fact that I am not married to my job and that I am able to spend more time with him. So while my party may be somewhat solitary, I am dancing (just like these beautiful nine ladies) to the beautiful music that has finally returned. When all the other parties of the season have faded away, I will still be celebrating and planning for the year to come. Yes, I do love December and the rest of the winter months. I have much to do inside these walls of my hibernation. But first I will begin with a party of my very own. Wishing you all time to party with Kith and Kin this holiday season! I’ve written this post for the 12 Days of Christmas Challenge, sponsored by the Casa De Hansen. 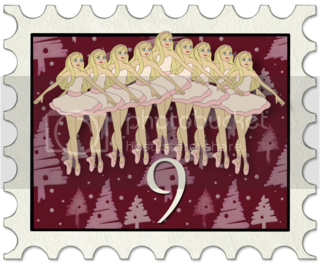 Today’s topic is Party Time based on the 9th Day of Christmas: “Nine Ladies Dancing”.